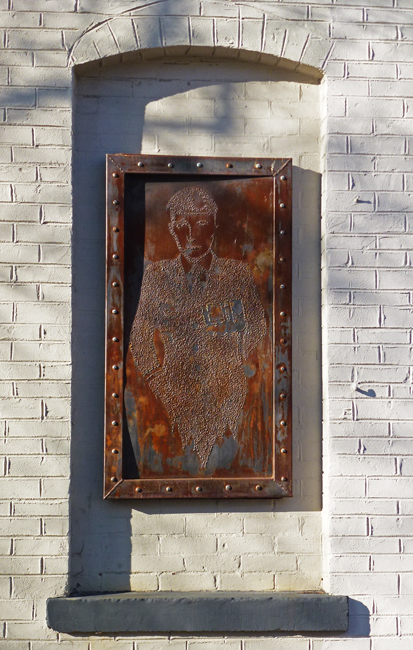 I spotted this unusual piece on the side of a building on Queen St W in the Parkdale neighbourhood. I'm not sure how it was done but it certainly makes the bricked-up window more interesting. New way of making a picture. Very nice discovery. Really cool find! It looks like it has been done by a nail punch. Great art for the space! That is an unusual find. I've never seen anything quite like it. It has a mysterious look to it. Very unusual! I like it. You are right, that is an unusual piece of art. Yes it does! What a nice find. What a great find! It is an interesting piece of art! Happy Friday, enjoy your weekend! Nice find, Pat, I like it too. Gorgeous piece and a great find+share. Have a Happy WE, Pat. I'm not sure either but it sure is cool!